I have a new favourite breakfast. Pope Joan opened mid-year, with an owner pedigree that ensured a smart fitout, a canny and classy menu, and the kind of publicity that generates a half-hour wait for a table on the first Saturday they were open. The co-owners hail from Circa (Matt Wilkinson) and the Kent Hotel in Carlton (Ben Foster). They've got plenty of room to play with on site. Behind the plate-glass front, round wooden tables plus a communal table affront the prep area, with extra kitchen space at the back. To one side, a covered area offers bench seating, while down the back a garden space is filled with luminous artifical grass, reclaimed school tables and a tidy herb garden. The menu is succinct, paying particular homage to the egg. Lunch specials are written up each day, such as a roast chicken sarnie, with stuffing, served swaddled in foil so all the warmth and aroma stays in until you're ready to eat. That's just one example of their attention to detail when it comes to presentation. It's not just the food: waitstaff deliver water from divine, floral-printed jugs. 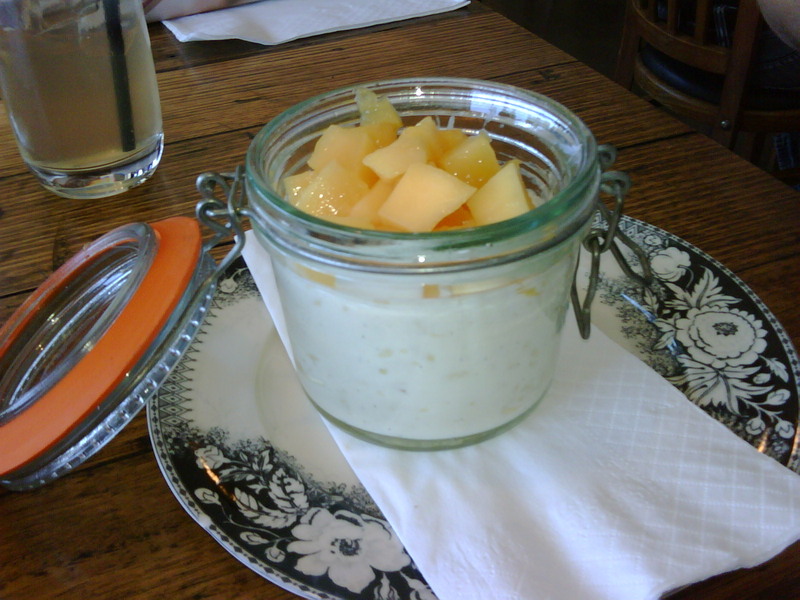 Then there's this take on rice pudding: The creamy pudding, with not a crunchy piece of rice in sight, is studded with vanilla. Mango on top sweetens it up and stops the dish being too sickly. You've got two boiled goodies, buttered soldiers, herbed salt and bacon bits. Is there any flavour better than egg and salt? And what fun to put together! The only thing that could have improved it would be the egg equivalent of a 'caramel stop'. Both eggs were piping hot, so there was no chance of keeping the yolk runny for the duration. And how much would you expect to pay for such breakfast enjoyment, replete with bespoke serving dish? It's just $9. Despite the pedigree, this place just doesn't seem to work. The menu is too egg-heavy, especially for lunch options. The sandwiches we ordered for our lunch, which were delicious, but were meagre in size. Service is haphazard, with many staff flitting around, but not focussing on getting orders taken or on scanning to see if anythig is required. While all of this was happening during the busy weekend lunchtime period, a couple of staff were perched on stools at the counter eating their lunch. Not a good look! 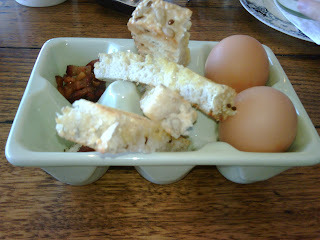 I agree that the bolied eggs with bits look good, but for two eggs you need a lot more soldiers. Hey David, thanks for your thoughts. They do love eggs on the menu! (Eggs have their own heading, and include the coddled variety in an English breakfast replete with black pudding.) The printed menu doesn't mention much about lunch, as it's normally done through the specials board. I've been happy with portion size - I haven't found them meagre, though certainly not huge, but I've found the produce good enough that they're always filling. And I've had attentive service, even when busy, but that is always a subjective experience.